Petisco (pronounced peteescoo) is the Portuguese word for tapa. 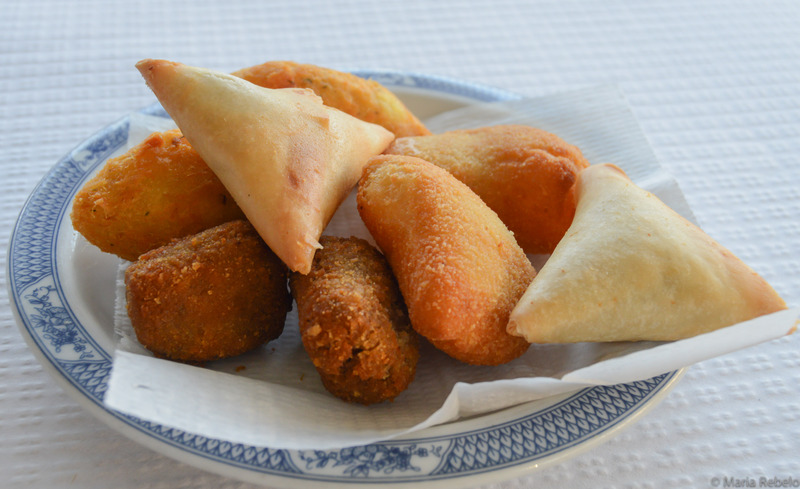 There are three very popular petiscos in Portugal. The first is the “bolo de bacalhau,” a fantastic creation that combines some of Portugal’s favorite ingredients–codfish, potatoes, onions, and parsley– into a single bite. The second is the “rissol,” a half-moon-shaped delicacy made with breaded pastry and a shrimp or berbigão filling. The third is the “croquete,” a cylinder of ground meat, delicately spiced, first coated with egg and bread crumbs and then fried. These finger foods are the perfect foil for a glass of great Portuguese red wine. Combine them with tomato rice, and you’ll have a very satisfying meal. The attentive reader will notice that there’s a fourth petisco in the photo. Well, the three musketeers were also four. The triangular-shaped “chamuça” is the D’Artagnan of petiscos. Inspired by Indian cuisine, it adds spice and excitement to the meal. Ummm! I am going to take this picture with me when I have lunch today at the cafeteria. Päo ralado em inglês é bread crumbs…näo crums…e as chamuças näo pertencem à cozinha nem aos petiscos portugueses…isso pertence à cozinha Indiana…o seu a seu dono…. In India the samosas are made with potatoes. What are chamucas made of?